It is not strange that a Parisian, accustomed to the beauty, luxury, and gaiety of his beloved capital, finds absence from it an intolerable exile. Many years ago, in the city of Hanover, Germany, I made the acquaintance of a poor old Frenchman who had been living there for thirty years without ever having been able to return to Paris. At last, having inherited a little money, he went back to France. I saw him subsequently in Paris, and he told me that his joy had been so great in once more seeing these familiar scenes that he had actually fallen ill from his excitement and delight. He was then, in fact, just able to go out again, and I would frequently meet him, walking slowly up and down the long allees, in the Garden of the Tuileries, his hands clasped behind him, a cane under his arm, and a look of supreme satisfaction on his face. One day I found him seated at a little table in front of one of the cafes on the Boulevard des Italiens. Pointing with one hand to the brilliant scene before him, and with the other holding a copy of the Figaro, he joyfully exclaimed: "Ah, monsieur, this is life! this is life! I am younger now by twenty years than when I was in Germany." In truth, there is something exhilarating in a great city. One may at times grow weary of its restless energy, but its incessant activity quite as frequently serves as a tonic. The heart beats faster, the cheeks flush, the step is quicker, and one catches the eager spirit, the earnest business tone, the sharp decision, and the rapid interchange of thought so characteristic of metropolitan existence. This partly accounts for the steady migration from country to city which has marked the last half-century. Men seek the intoxication of city life as they do that of strong wine; and, having tasted of the stimulant, will not leave the pavements for green fields. After the roar of the city the quiet of the country seems to them unbearable. They love the contact of their fellow-men, the wonderful variety of sight and sound, and the new attractions that always seek a city to gain a hearing and a reputation. The heart of a great State is like the heart of man, which never rests; and its streets and boulevards resemble human veins and arteries through which the warm life-current pulsates ceaselessly. 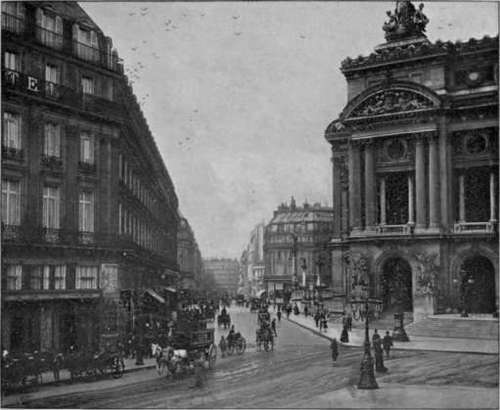 Rue Auber And The Grand Opera House. An American in Paris soon perceives that the European idea of streets and sidewalks is very different from his own. With us they are thoroughfares, nothing more, - a means of going from one point to another. But in Europe, and particularly in Paris, they are places of recreation, where one meets friends, partakes of light refreshments, and observes life. Another peculiarity, not only of the boulevards, but of almost all Parisian streets, is their gaily painted metal kiosques. These are attractive even by day; but in the evening they are especially picturesque, since they are lighted from within, and with their multicolored panes of glass resemble mammoth Chinese lanterns placed upon the ground. 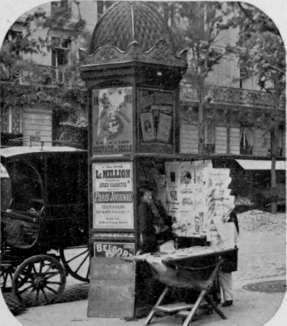 In each of them a woman's head emerges from a mass of newspapers, books, and railway guides; for these kiosques are the news-stands of the city, at once convenient, useful, and artistic. In fact, one cannot speak too highly of the artistic forms in which commonplace objects in Parisian streets are cast. Theatrical programmes, for example, are displayed on pretty circular towers instead of monstrous bill-boards of unfinished wood, and even the lamp-posts are of ornamental bronze, each one a work, not merely of utility, but of beauty. The Grand Opera House, Paris. The streets themselves, like those of most European cities, are admirably paved, and on the corner of each one, however small, is seen its name in large, white letters on blue enamel. 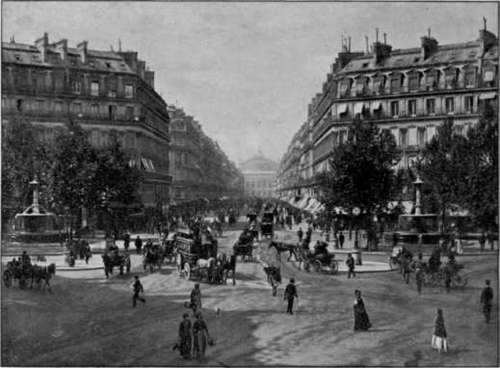 The buildings, too, instead of being painfully irregular, have a uniform height; and, best of all, the hideous telegraph-poles, which, in our avenues, often rise like gallows to destroy their beauty, are wholly wanting here, since, for appearance as well as for safety, all wires in Paris are put underground. 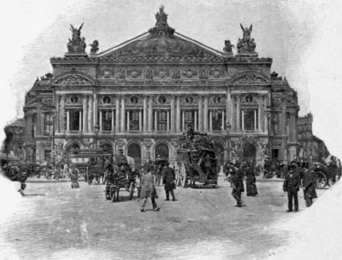 The most prom-i n e n t point on the Grand Boulevards is the Place de l'Opera, - embellished by the wonderful Academy of Music, which in its vast proportions and magnificent decorations is unsurpassed by any similar structure, not excepting even the splendid Opera House and Theatre of Vienna.